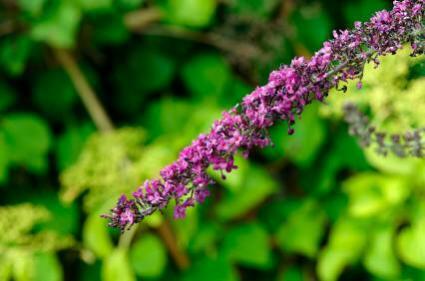 There are around 900 species in the genus Salvia, which includes shrubs, perennials, and annuals. Some species are grown for culinary use and others as ornamental plants. Many species also have medicinal uses. The name is based on the Latin 'salvere', 'to save'. The plant has been widely respected for its healing properties. The ancient Greeks used it to treat ulcers, consumption, and snake bites; the Chinese used it for a variety of conditions; and many Native American tribes relied on its healing abilities. Many species, as well as hybrids and cultivars, are grown as ornamental plants. Ornamental salvia can be annuals, tender perennials commonly grown as annuals, or hardy perennials. Size varies greatly by species, with some plants reaching six feet in height and others no more than a foot. Salvias have brilliantly-colored flowers. Foliage is sometimes scented and quite attractive. Most salvia prefers full sun, but there are also those that will bloom well in part shade. They like well-drained soils and are not fussy about pH levels. Most are quite drought-tolerant. Wait to plant annual and tender species until the danger of frost is past. Deadheading will prolong the bloom period. Some species, especially S. nemorosa, will re-bloom in the fall if they are cut back hard after their first bloom period. Many tender or annual species bloom all summer long. Perennial sage should be divided in early spring, before new growth begins. Sages should be pruned after flowering or pruned for shape as needed. Don't prune hard in the late fall. Species that get very large will require pruning to maintain an attractive appearance. Some species will become quite woody after four or five years, and may need to be replaced with young plants. These species have various cold tolerances. Some do well as far north as zone 4. Salvia nemorosa, sometimes listed as S. x superba These are hardy to zone 4. They will re-bloom if cut back after their first flowering. 'May Night' was named the 1997 Perennial Plant of the Year by the Perennial Plant Association. This species is widely available. Salvia officinalis - Common Sage - culinary uses, but some cultivars are grown ornamentally for their attractive foliage. Salvias are relatively free of problems. They can suffer from stem and root rot or powdery mildew, particularly under damp, cool conditions. Ornamental salvias are used for massing, borders, containers, accents, and cut flowers. They are extremely attractive to hummingbirds and butterflies. S. officinalis and S. fruticosa are used for cooking, particularly in stuffing and dressings. See Sage for more information about culinary sage. Many sages have been used medicinally in cultures around the world. Most of the aromatic sages have anti-inflammatory properties. White sage, S. apiana, is traditionally used in smudge sticks by many native North American tribes. It has a wonderful scent, as well as medicinal properties when used as a tincture. S. divinorum, a North American native plant, is called Diviner's Sage or Yerba de la Pastora. It possesses strong psychoactive properties.